With babies come big bucks - the U.S. government estimates it costs nearly $200,000 to raise a child to age 18. Cutting coupons is one option for saving, but there are other ways to get the most for your money. For their book "Baby Bargains" husband-and-wife team Denise and Allan Fields thoroughly researched the best in baby gear, helping you to figure out how to save on what you really need. Now in its eighth edition, "Baby Bargains" is a veritable reference guide to all there is to know about making purchases for your baby. The Fields penned the book after their first child was born, making it their third highly successful book on money-saving strategies. For "Baby Bargains" the couple spoke with more than 100 first-time parents, plus a panel of juvenile products retailers, to figure out how to save and where to spend. We spoke with Alan Field to get the inside scoop. 1. There are so many items to buy - when is it a good idea to be willing to spend more, and what are some places to save? I think a car seat is worth investing a little more money in, because sadly, vehicle accidents are still the number one cause of injury to young children under the age of 4. Investing a little bit more money in a car seat usually means the seat is a bit easier to use and adjust. So we're not just talking about spending money to get a fancier looking car seat. I'm talking about investing in a car seat that has features like side impact protection or an adjustable harness. One of the key issues with a car seat is misuse or not adjusting it correctly, so investing in something you're not going to be wrestling with in the back of the car is worth it. In terms of things to cut back on, for a lot of people highchairs may not be necessary. There are several new products on the market today that are popular - one is called the Fisher Price Space Saver. Basically it's a chair with a tray that straps to a regular kitchen chair. It costs about half the price of a high chair and is great for people who don't have that much room in their kitchen. 2. In your book you talk about avoiding stores with "baby" in the name - why is that? 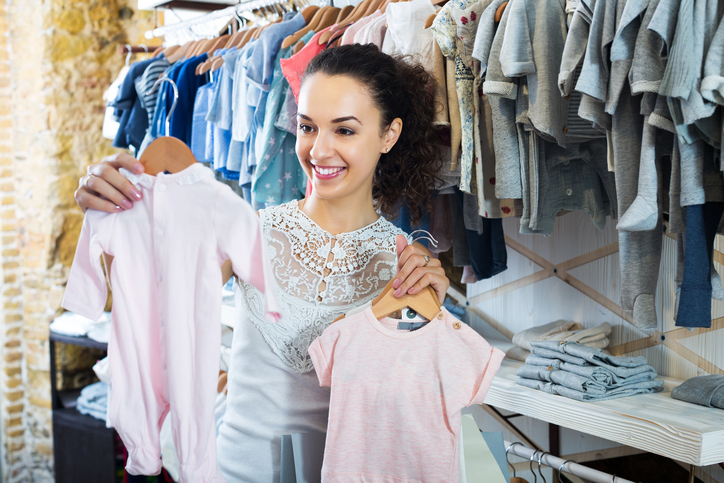 Stores that cater to baby are successful in focusing on that market; however, sometimes you can find the same items for a lower price at a store that doesn't have 'baby' in its name. A classic example is baby furniture: a lot of people buy, for example, a dresser for a nursery, but it doesn't have to be bought at a baby store - it can be bought at a place that sells dressers. Think outside of the box. Safety gates are often sold in pet stores for less money. Humidifiers are another example. There are all these cute baby humidifiers but it doesn't really matter, you can buy a humidifier at lots of different places. Sometimes you get a better deal with better quality than you would buying at a baby store. 3. It's easy for parents to become loyal to certain baby brands, but is that a good idea? Just because a company has a well-known name doesn't mean they'll have a successful product. For example Combi is a well-known Japanese brand of strollers, but their last several attempts at highchairs have flopped. Just because you like one Graco item doesn't mean that everything that Graco makes is going to work for you, or is the best in the category. Brands have strengths in categories - Graco is strong in strollers, swings and infant car seats, but they have not been very successful in convertible car seats. It's a little more nuanced and complex when it comes to brand names. 4. Are Grow-With-The-Child Products Worth The Cost? A lot of multi-functional products are out there, but usually there's a law of diminishing returns. In other words, a product might do one thing and morph into another, but when the manufacturer tries to morph it into a third or fourth product, that's usually when things go wrong. It's not necessarily bad to think about a convertible car seat that turns into a booster, but I think you should look at it with a skeptical eye when doing your research. Don't assume that if a product has seven different functions it means it's seven times better than a single-use product. Sometimes simpler is better when it comes to baby gear. 5. What Are Some Simple Tips for Making Major Purchases? One of the key things that we suggest to our readers is that they consult with experienced moms, as well as proxies like message boards. On babybargains.com we have a message board with over 2,000 posts a day. In the car seat forum the moderator is a certified child passenger safety technician. It's also helpful to think about what you really need. Strollers are a good example of that. You kind of have to match strollers to your lifestyle, instead of just merely buying something that the salesperson suggested, or simply getting something because it's popular. Think about your own needs, because where you live and how you're going to use the stroller factors greatly into what kind of stroller is best. Any recommendations for buying from less traditional sources of baby gear - for example, Craigslist or deal a day sites like Groupon? Craigslist and eBay are great for hand-me-downs and second hand gear. It's important to know what the list price of the product you're searching for is, as well as what the typical price variable is on eBay and Craigslist is for these items. A Bugaboo or Peg Perego stroller is worth a lot more at resale than a Graco stroller is. So, don't be persuaded into buying something just because it's on Craigslist. A deal-a-day site is also a great way to save. Most people use several different strategies, and those deal a day sites are very helpful. They are a way of helping to sample different things. For example there might be a discount on a Gymboree-style class in your community. You can sample a class at half-off and decide if you really want to do it before paying full price.